North of St. Louis and a bit west of the Mississippi River, Dancing Rabbit is in the eastern edge of what was once America’s great prairie. The prairie is now mostly gone, having been decimated by US agricultural and livestock management practices. Less than 2% of the prairie remains and most people don’t seem to care. Why should they? Grass is grass and why would we need huge expanses of it, right? 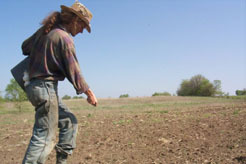 Even many environmentalists fail to get as enthused about prairie restoration as about reforestation or saving water ecosystems. Yet the prairie is a rich ecosystem full of a tremendous diversity of flora which in turn supports a robust diversity of animals and insects. Same field as above 2 years later. Check out those native grasses! There is no need to go into the details of why biodiversity is important here, since there is literature aplenty proving its value. 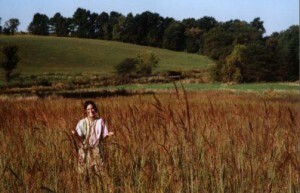 Dancing Rabbit’s land is primarily made up of old fields that had been farmed extensively up until 1987. Monocultures have already taken their toll on much of the area. One of our justifications for building a new ecovillage instead of retrofitting an existing building site is that it gives us an opportunity to actively work at restoring some of this area and manage its development toward a more diverse prairie and savannah system. Fortunately, the federal government and the Missouri Department of Conservation agree that this is important work. Most of our land is in a federal program called the Conservation Reserve Program or CRP. In fact, most of the land was in CRP for 10 years before we arrived, saving it from destructive agricultural practices and giving the fields a chance to reestablish their soil and roots. We have utilized the program even further and are working to actively reforest parts of the property to prevent erosion and provide wildlife habitat and to re-establish native prairie grasses and forbs (wildflowers) in other fields. We’ve planted native grasses in over 15 acres and have been maintaining them with regular prescribed burns, an essential part of the prairie’s life cycle. We hope to rebuild the diversity of plots by replanting patches of the few native wildflowers and grasses that can still be found in northeast Missouri. While we do not work directly on wildlife management of native animals, our land provides a sanctuary from the expanding farms, roads and towns elsewhere. Plant native grasses and flowers in your backyard or local community garden. Support organizations such as Seed Savers Exchange (3076 North Winn Road, Decorah, Iowa 52101) or others which are working as seed “libraries” for many otherwise hard to find plants. Do not support companies that contribute to sprawl and build over undeveloped terrain and let them know about it. These resources provide good starting information and can be good contacts for where to get more information. For an in-depth start and reference guide, I would recommend the Tallgrass Restoration Handbook (listed below).